PandoraBots AI autoresponder is back! The PandoraBots AI autoresponder is back working with SmartBots! Pandorabots service has gone offline in February and was inaccessible for several weeks. After the service was reinstated it turned out that all AIML (AI language files) have been lost, including SmartBots configs. Guys from Pandorabots were working to restore these configs, and finally they got restored SmartBots brains as well. Now AI autoresponder is working back again! 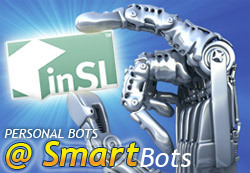 SmartBots has its own simple autoresponder module which works based on simple rules (read the documentation). You can use any autoresponder you wish: Pandora, Simple or even both. Note: if you are using a Simple Autoresponder now, please talk to the bot to ensure that you don’t get replies both from AI and Simple engines.